Managers reported spending 18% to 26% of their time dealing with conflict in the workplace (Thomas and Schmidt, 1976). Enormous investment with resources and time are spent dealing with conflict in the workplace. Middle managers are often the frontline and first responders toward attempting to resolve employee conflict. 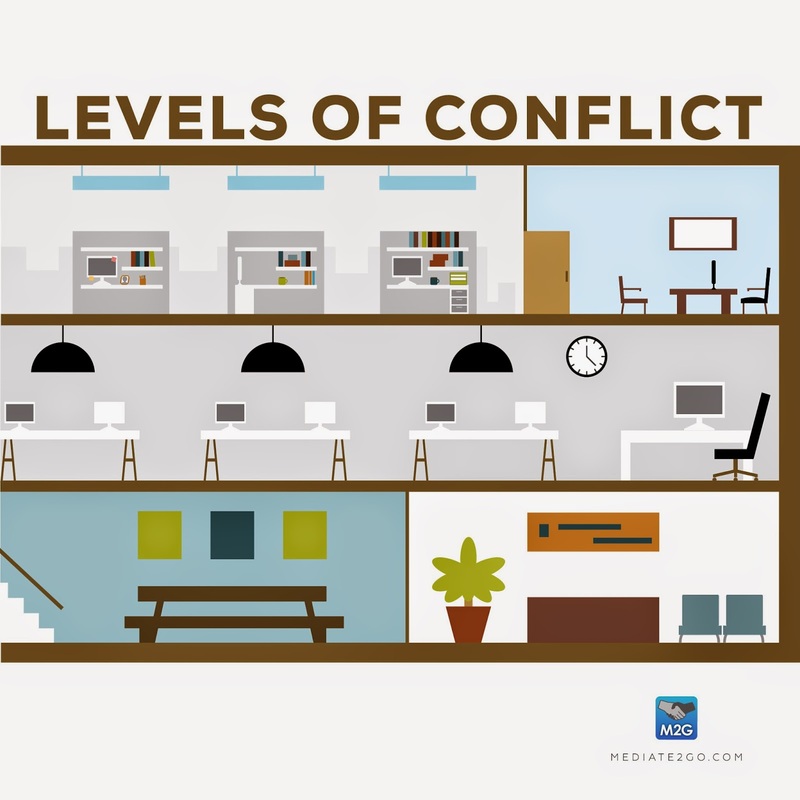 The effects of conflict not only take time from the staff involved, but also contribute to increasing sick days/absence, decreasing morale, creating a negative culture, and impeding efficiency and productivity. Nonetheless, not all conflict in the workplace is negative (see our blog on how conflict is good for business and innovation. Conflict can be productive and promote growth at all levels. Accordingly, conflict can be constructive and resolve a number of issues by producing high quality decisions and result in learning and innovation. To make conflict management a strategic priority, organizational leadership must do some preparation to better inform themselves, and to use the knowledge gained to take action. In order to make conflict management a strategic priority, agencies can do the following. In order for the workplace to understand conflict; all employees must be conflict literate. Again, not all conflict is bad, and employees must come to an understanding that conflict can be positive and productive. Our blogs about conflict escalation and taking self leadership in conflict explain how to make positive a good thing. In the next team meeting, put conflict management as an agenda item for discussion, allocate 5-10 minutes to have a general discussion. A goal for the discussion could be developing a list of negative and positive conflicts in the workplace, and further analyzing what are advantages and disadvantages of conflict in the work place. Depending on the energy of conversation, propose continuing the discussion of conflict management at the next team meeting. 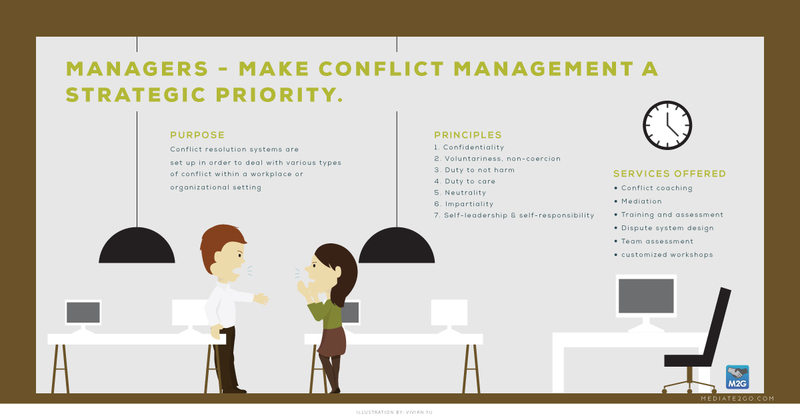 Recommend that your team read the blog on conflict management styles. There are a number of trainings and personality tests that can be done in the workplace to help inform employees about their conflict management style and personality as it relates to conflict. Generally these assessments have a cost, and following the training, much of the knowledge gained is lost, because managers do not utilize the learning into supervision, appraisals and team meetings. Nevertheless, managers need to take an active role and utilize the learning to identify the employees style of conflict, and to develop a common framework for their team. Ask for the help of a conflict resolution expert, coach or mediator to help integrate conflict management into your organizational processes. The Thomas-Kilmann Conflict Mode Instrument (TKI) is an assessment tool that can be used to identify the different styles of conflict among staff. The TKI is a self-reported assessment that allows employees to discover whether they are overusing or under using one or more of five conflict- handling modes: competing, collaborating, compromising, avoiding, and accommodating. By discussing the different conflict styles, employees will begin to frame and define their conflict styles, and relate it to the workplace. Starting with such a framework will help increase knowledge with employees about conflict styles. We’ve developed an easy to read blog with songs to demonstrate each conflict management style. Note: If your organization has limited funding, contact a mediator or conflict coach in the area who might be able to provide training at a discounted rate. Managers need to play an active role by identifying, building, and coaching conflict management styles and improved performance with staff. Measurement and indicators are incredibly important to determine growth and opportunity. Managers can utilize assessments, such as TKI to bring to light different conflict-handling modes, and to develop competencies and goals around utilizing the styles. Accountability is important for growth, so the manager should continue to follow through and measure performance. The TKI should be used as a ‘carrot’ as opposed to a ‘stick’. Employees need positive encouragement and coaching/supervision sessions to ensure they are on the right track. If the team has gone through a TKI assessment, review individual TKI reports with staff. Engage in a discussion about their thoughts concerning the report, and develop an action plan for growth. The employee must be confident and informed about the items and skills they need to work on. The manager can help develop indicators and goals to measure performance to determine growth. In the event that a TKI assessment is not available, the manager can openly discuss conflict styles in the workplace, and identify general positive or negative challenges that the staff person is facing. Read this blog as a resource. 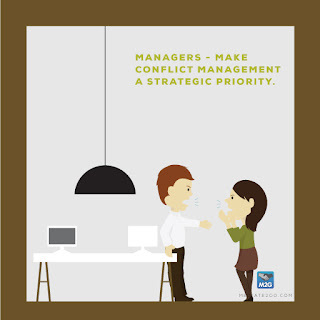 In a workplace setting where there is an absence of a positive culture of conflict, it would be difficult for a manager to involve top management to add conflict management as a strategic priority right away. If managers decide to ‘pilot’ a positive conflict culture on their team, there will be positive outcomes and measures that stand out compared to other departments. Making conflict management a goal for a team will result in high performance. Moreover, encouraging and fostering a positive conflict culture that addresses each level of conflict will help contribute to reducing sick days and absenteeism, increase morale, create a vibrant positive culture, and increase efficiency and productivity. These outcomes will draw attention to the team, and managers will have better evidence for top managers to consider making a conflict management a strategic priority. It is important for high performing and positive conflict management teams to lead. Although top management may not initially be receptive to making conflict management a priority, managers have a great opportunity to demonstrate the positive outcomes from their teams that have a strong conflict management approach. Measurement will be an important influencer to making a good argument with top management. In order to ensure that the argument is strong, managers must define conflict on their team, invest in conflict training, acknowledge and measure conflict skills, and make their team stand with their positive outcomes of being a positive conflict team. Check out a list of professionals in your area that may provide conflict resolution training. Do you have a workplace conflict? 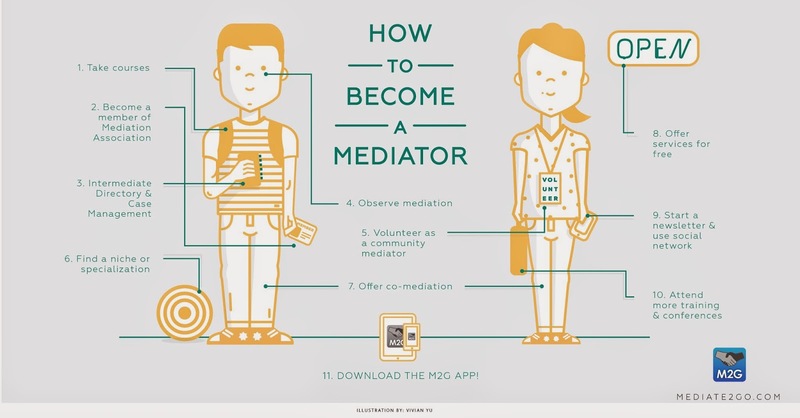 Need a mediator for your workplace? Check out a list of professional mediators on the Mediate2go Directory. For the past 10 years, Evan Muller-Cheng has worked in a variety of community based and social service settings that ranged from Police Services, Federal and Municipal governments, and non-profits. Evan has a graduate degree from The University of Ottawa in Criminology, and a Master’s of Health Administration at the University of Toronto. Currently, Evan is the Manager of Community Initiatives with Agincourt Community Services Association (ACSA). Specifically, Evan’s portfolio includes overseeing a community centre, food security programming, a Scarborough youth in conflict with the law program, and overseeing over 30 communities based, youth based social enterprise, and a micro grant distribution program. For fun, Evan bikes, cooks and makes everyone smile at ACSA.